Asieh Golozar is a director of Epidemiology and Real World Evidence within the Oncology Business Unit, global Medical Affairs organization at AstraZeneca. Asieh received her Doctoral degree in Epidemiology and a Masters of Health Sciences in Biostatistics from JHU which was supported by a postdoctoral research fellowship award with the NCI, Division of Cancer Epidemiology and Genetics. Prior to that, she trained as a medical doctor at Tehran University of Medical Sciences. Upon receiving her PhD, she joined the faculty at the Department of Epidemiology, JHU School of Public Health focusing on cancer and diabetes epidemiology, application of epidemiologic and statistical methods for robust synthesis of evidence from epidemiologic data and applying evidence-based findings to strengthen public heath infrastructure and policies. 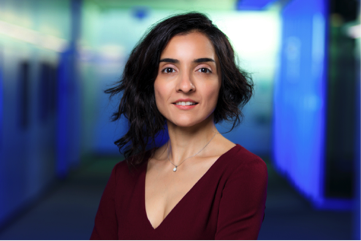 Upon joining industry, Asieh has been responsible for leading life cycle management and real-world evidence generation activities in different therapeutic areas including oncology and women’s health. She holds an adjunct faculty position at the JHU School of Public Health.